If nations printed their own money instead of issuing bonds to pay their debts and/or fund programs, the results would be inflationary. ca•nard. noun. A deliberately misleading fabrication. Under the current system in the U.S., the federal government issues bonds to receive currency that it uses, in turn, to pay its debts and/or to fund programs. 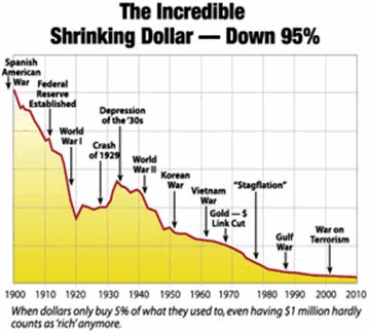 The results have been inflationary, with the nation’s legal tender (Federal Reserve Notes) worth pennies on the dollar relative to when they were first issued by the Federal Reserve in 1913. This inflation is caused by the interest charged on the bonds, which is never created. Thus increasingly greater amounts of bonds must be issued, each with its corresponding interest, to pay the mounting interest on the debt. This geometric progression of debt is not only inflationary, but results in ever greater percentages of assets in the possession of the bondholders. 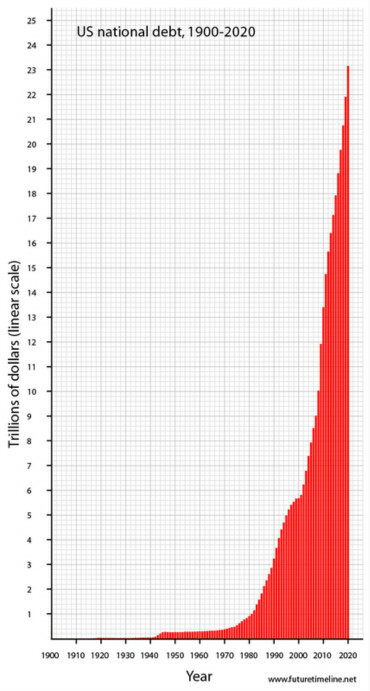 If the federal government was able to issue debt free currency to pay for its debts and/or fund programs, and it did so in proportion to the value of the goods and services generated by its labor force, there would be no inflation and the value of, in this case, sovereign currency would be stable.